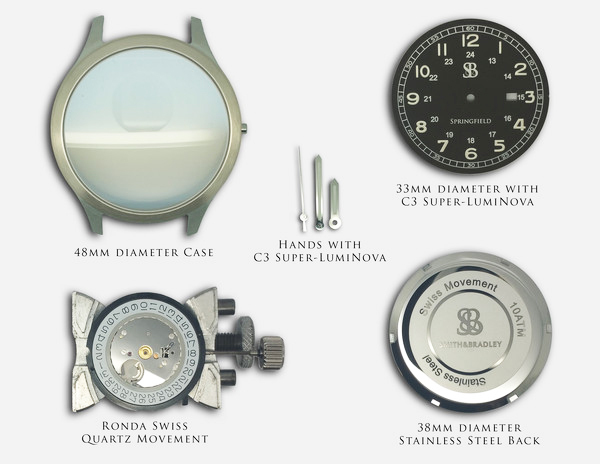 “Both of our fathers and grandfathers had classic American watches. Growing up we admired these pieces in hopes that one day they would be ours. That hope became a reality and served as the fundamental groundwork for our company Smith and Bradley. “Since the end of 2012 we have been designing and building watches at our Sydney Illinois workshop in the hopes of outfitting a new generation of watch lovers with traditional quality time pieces that blend form and function. Along the way we noticed a somewhat disturbing trend. A handful of watch companies, most with a very good product and excessive marketing budgets, began selling the classic American field watch, for high prices often in excess of $1,000. Without a doubt the field watch of generations past, while not sacrificing quality, were far less expensive and therefore more attainable. “In designing our latest Kickstarter project, the Springfield, we called on this history. The Springfield case is crafted from a solid 316 L stainless steel block and includes a unique domed sapphire crystal and a rock solid Swiss movement. Each watch is built in our Sidney Illinois workshop and are finished with an American Cordura strap. While this is a simple watch with a simple design, the goal which we are trying to achieve is far more complicated in today’s luxury watch market–a solid watch at an affordable price. Springfield will have either a stainless steel-finished case or a dark PVD-coated case. 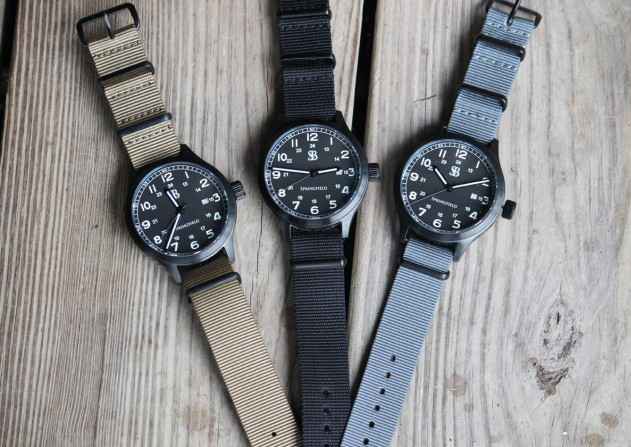 The initial watch will ride on NATO-style Cordura straps in Black, Tan, or Green. Upon reaching “stretch goals” of $45,000 and $55,000, there will be available black and brown American leather bands or mesh stainless bands, respectively. The Kickstarter project has 13 days to go as of this writing. Since I already own one of their watches and I am very satisfied with its build, I have pledged my $159.00, plus $10.00 shipping, for a Smith & Bradley Springfield. Now for the hard part, to sit back and wait. This entry was posted in Watches and tagged Field Watch, Smith & Bradley Watches. Bookmark the permalink.